Vaccination is an important part of a sound preventative health care plan for your horse. In addition to a regular de-worming program, adequate dental care, and a routine physical exam, vaccinations can help to prevent or at least reduce the likelihood and severity that your horse will contract certain diseases. I generally approach vaccination strategies based upon the risk of your horse contracting the disease and the eventual effect or consequence of that particular disease. The following recommendations are for a mature non-pregnant, pleasure horse. Influenza, Rhinopneumonitis, East/West Sleeping Sickness, West Nile Virus, Tetanus and sometimes Strangles are the typical diseases that we recommend vaccination for. Influenza produces a high fever and respiratory infection and is spread from horse to horse by direct contact or by coughing. Vaccination should occur at least every 6 months. Equine Herpes virus 1 and 4 produces disease that may affect the respiratory tract, neurologic system, or may cause abortion. It often produces fever, coughing and is also spread from horse to horse. Horses can become persistently infected. Vaccination only produces immunity for 2 months. Eastern and Western Encephalomyelitis (Sleeping Sickness) produce disease of the neurologic system. While fairly rare, the disease can eventually cause death. The disease is spread by mosquitoes. Vaccination is once a year, generally in the spring. West Nile Virus is also a viral disease affecting the neurologic system. To date, only a few horses have been affected in Washington state, and these have been non-vaccinated individuals. Most horses become moderately to severely affected and approximately 40% eventually will die. Vaccination recommendations for our area are currently once a year. Tetanus is a disease caused by toxins produced by the bacteria clostridium tetani. This bacteria is assumed to be ever present in the environment.Bacterial spores proliferate in tissue that lack oxygen. That is why puncture wounds are an obvious concern. Horses are highly susceptible to tetanus and can die from the disease. Vaccination is recommended once a year. Strangles is a disease caused by another bacteria, S. equi. This bacteria is passed from horse to horse by direct contact, or contact with moist nasal and oral secretions or pus from an affected horse. Horses become very sick, but the majority eventually recover. Vaccination is one to two times per year. These vaccines constitute a basic program, however the age, intended use, breeding status, travel/show plans, and housing are all other factors that affect vaccination decisions for horses from the Inland Northwest. If you have specific questions about your horse, please give us a call. We’ll be glad to help. 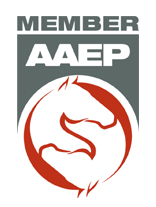 Additional vaccination guidelines can be found at aaep.org (See our link at lower left hand corner).